Award Winning Broadcast Journalist, Nina Myskow was educated at Wykeham School in South Africa, Bell Baxter School in Scotland, and St Andrews University, where she read English and a lot of trashy novels. She completed the novels but not the degree, and embarked on her writing career on the teenage magazine, Jackie. She was made editor, becoming the first female editor in the history of the publisher, DC Thomson. Pop writer on The Sun, TV Critic on the Sunday People and the News of the World, her series of celebrity body image interviews, The Real Real Me, was a weekly feature in the Daily Mirror for four years. Her celebrity interviews are published in both national and international publications. Currently alongside her other work, Nina is the Creative Director on Jackie-The Musical, touring the UK in 2016. Nina is a regular presenter and guest on This Morning, The Wright Stuff, Big Brother commenting regularly on Eviction nights as well as a popular talking head for MTV programming! She is also a regular panelist for The Wright Stuff on Ch5. She has appeared on Grumpy Old Woman and Grumpy Old Travelers, Trust Me I’m A Holiday Rep (which she was lucky enough to win)and countless documentaries. A judge on three series of New Faces, a regular panellist on Through The Keyhole, she presented her own show Nina vs. The Rest on BSB and co-hosted The Love Weekend on C4. She has presented, and contributes regularly to, shows on Radio 2, 4 and 5,GLR and Talk Radio. 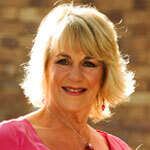 Nina can be heard on her own BBC radio4 shows and also regularly giving her opinions on a range of Ch5 documentaries! In addition in 2015 Nina attended and was thrilled to win Silver at New York Festivals International Radio Program Awards for her documentary, ‘Meet The Wainwrights’. She lives in the hopes of being invited once again to open a Haagen Dazs ice cream parlour. The contract stated, “Must be photographed sampling the product.” She complied.